Today we’d like to introduce you to Jason Polins. I’ve been interested in the visual arts ever since I was a young boy. As a teenager and young adult, I engaged in as many opportunities of drawing and painting as I could. I gravitated to realism as my preferred way to describe the world around me. Realism is superb at getting to a more connected and deeper visual expression than other methods of depiction. I graduated from Boston University’s Visual Arts Program, where I spent 4 years being taught what they offered…. during that time, I was never satisfied. A few years out of college I was fortunate enough to discover the Florence Academy of Art located in Florence Italy. I was accepted, packed up and went off to learn anew all that I had been taught and felt was missing from my University experience. It was a truly immersive bootcamp education. Rigorous and exacting work… A great education. Upon graduating I returned to Boston and was able to meet and work with two other mentors. Gary Hoffmann in Boston and Nelson Shanks in Philadelphia. Gary is an amazing painter, still living and working in the Boston area. He was trained by Ives Gammell, who was part of a lineage of Boston Painters going back to Frank Duvenek, including John Singer Sargent. Gary is a living legend whose knowledge of painting is as complex as nature itself. My other great influence is Nelson Shanks, who sadly passed away 2 years ago now. He was the most influential mentor I have ever had. He is a world-renowned painter. A true master and was the greatest living painter of our day. He has painted dignitaries from around the world including Pope John Paul II and HRH Diana. Always working from life, his sitters and subjects are in front of him when he works. Learning from him changed everything for me, from my process to my teaching ethics. His lasting influence on me, aside from his philosophy of painting, is to keep a high standard of excellence in the visual arts by painting as true to myself as possible and teaching to the best of my ability without exception. I teach because I know what I want to do better than the teachers I had as a student, as well as seeing so much sub-par instruction going on today. High school, University and College art educations are notoriously poor programs these days. Something not generally discussed, unless one knows better… Anyway, there is great value to imparting, in those looking for sound education in painting and drawing, a higher degree of ability. What I offer is available to anyone whether they want to be professionals or hobbyists. I want students to learn these abilities in order to do what they want with them. It’s about enabling the individual with competence rather than being stifled by inability. I paint because I’m moved by the beauty of Nature and our modern world. My subjects include portraiture, figure painting/drawing, still life and landscape/cityscape. Everywhere I turn I see more to paint about. The experience of having someone sit for a drawing or painting and describe who they are, imbuing a portrait with a sense of the individual, their unique essence. Or the delicate way light falls on shapes in a still life. The hue, value and chroma of it all. What does it mean that these objects are being put together, why and how it all works. Or landscape painting, which pulls us in awe of nature’s depth. Billions of years of development and change for us to study and learn from. Landscape is a crucial endeavor, as we all belong out in nature. As humans, we seek to reconnect to nature on so many levels. It provides a centering of ourselves in a way that reminds us we belong to something much bigger than our constructed environment. So here I am, I’ve got this great studio. I’m completely immersed in what I do and I am totally energized to have students to share it with and help them in their excitement of their own work! It’s a great opportunity for all. I have had many students throughout the years. Some come and go, some come back after being away for a while and some stick around! Everyone that has come to my studio sees the school in different ways. It is a school for creativity in their weekly endeavor. Some are searching for a better way to express themselves. It’s a happy place for others, or even a way to cope in a creative manner. All are valid reasons to be here. Ideally, my school is a place to take the time to learn and experiment with a sound artistic process. If you are willing to forego the expectations of creating “art”, then you can make room to learn. In this way, it is really about showing people problem solving skills. This artistic process isn’t solely restricted to picture making, but rather life and how you view its larger goals. That’s the toughest challenge, showing people it’s a bigger picture that we are after. I remain patient, passionate and willing. I think that is a method for success, for everyone in the studio. I have relied mostly on word of mouth to get the word out about what I offer, thanks BostonVoyager! Word of mouth is king. I am my own best advocate. With very little in the way of advertising budget, I am always looking for opportunities of free online presence as well as doing my best to get my website SEO optimized. Being a Small business, it has always been a somewhat fine line of making ends meet. I can’t predict how many students are coming or going. There’s always a risk, but I love what I do so I try my best to find ways to stay open no matter what. That being said, I have always been an advocate of weathering the storm and holding on for sunnier days! I am also constantly working on my own paintings and the occasional commission. Can’t be a painter if I don’t paint! All of which are for sale at a few galleries as well as in my studio. Come on by and see what I’m up to, visitors are always welcome, I might even make you sit for a portrait! Please tell us about The Boston School of Painting. 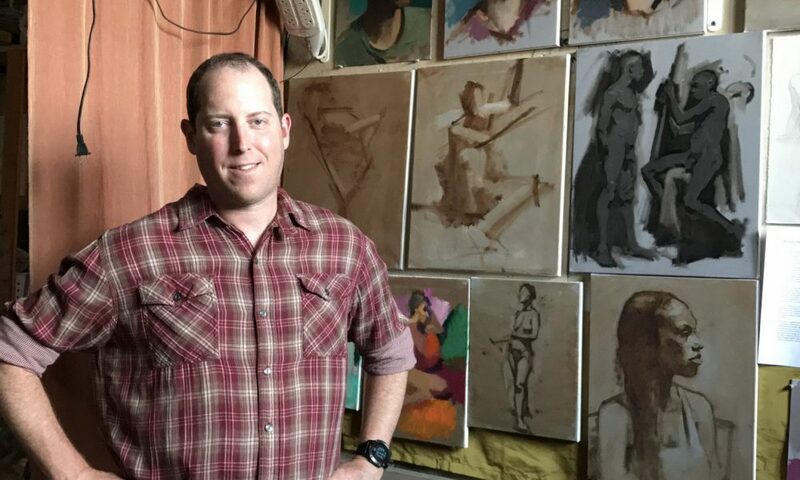 The Boston School of Painting aims to provide art students and professional working artists alike with training in the fundamentals and advanced concepts of painting and drawing in the tradition of Classical and Contemporary Realism. Constructed on the French and Italian Atelier system, the Boston School of Painting seeks to combine these methodologies with contemporary approaches. Our mission is to stimulate both public and private artistic advancement, to maintain an environment fostering mutual pursuit of excellence, and to apply the tools necessary for developing rewarding careers in the arts. We strive for excellence in the pursuit of painting and drawing by investigating integral concepts of drawing and painting from direct observation. Class sizes are small and include significant one-to-one student/instructor interaction as well as demonstrations on process and approach. Through direct guidance we remain aware of each individual in their development as a student. It is our job as a learning institution to be a source of stimulation, guidance and healthy competition.